What development tools are there? How can the GUI designer define the HTML if Click Controls generates everything? How can I have many Pages using the same HTML template? Why do control listener methods have to return a boolean value? Can you exclude some fields from a Form? How do you internationalize Pages and Controls? How do you encode Pages in the UTF-8 character set? How do you specify the character set which is used in your application? How can you prevent multiple form posts? How can I use *.html Click pages? Can Click be mapped to an extension other than *.htm? Why am I getting "IllegalAccessException: Class org.apache.click.util.PropertyUtils can not access a member ..."? What JARs should I use with Click and Cayenne? How can you integrate Click into Spring? How can I render PDF and Excel documents? What is the performance of Click? How do I unit test Click pages? How do I deploy Click resources in restricted environments? Why doesn't Click use Commons Logging / Log4J for logging? Why doesn't Click use FreeMarker as the default rendering engine? Can Click be used to develop Portlet applications? Why develop a new Web Application Framework? 1. How to get help? OK you have read the documentation and reviewed the Examples applications, but there is still something you still don't understand. What do you do? You go to the click-user or click-development mail news groups. This is where you get support from in open source projects. Its free, friendly and usually pretty responsive. These news groups are where other people ask questions, and where users and developers discuss ideas. Its highly recommended, so don't be shy. 2. What about Commercial Support? If you want commercial support or training for Click, you can obtain this from Avoka Technologies. For more details please email Malcolm Edgar. 3. What development tools are there? ClickIDE is an Eclipse Web Tools Project (WTP) plugin. 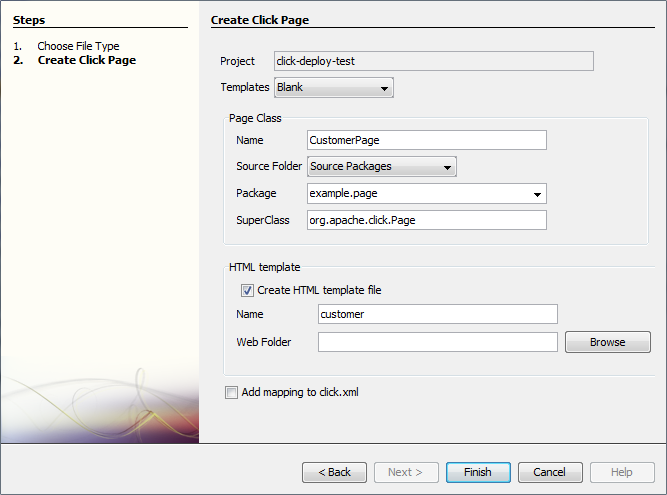 To use the ClickIDE plugin, create a "Dynamic Web Project" and select the "Click" Project Facet. NetBeans plug-in for Click is under development by Hantsy Bai. Velocitywebedit is a Velocity and HTML Editor plugin for Eclipse. 4. How can the GUI designer define the HTML if Click Controls generates everything? 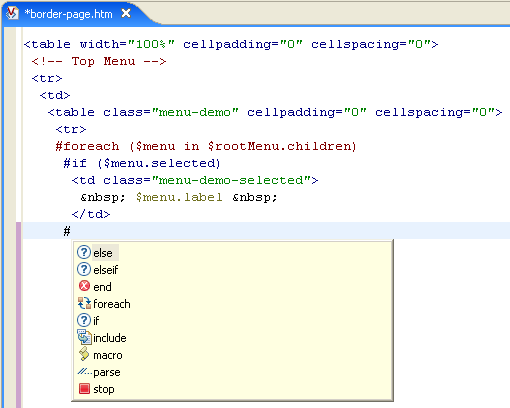 In Click there is nothing preventing you from laying out HTML forms by hand. It just provides the option of doing it automatically for you. Use Click forms and controls to do all the HTML rendering for you. This a 80/20 approach where you can quickly get stuff developed, but it may not meet all your UI style requirements. Please note the Forms control provides many auto layout options, see the click-examples 'Form Properties' for a demonstration. The Form control also renders the class attributes 'form', 'fields', 'errors' and 'buttons' in the form's HTML elements enabling fine grained CSS control. Fields are also rendered with an 'id' attribute enabling manipulation of individual fields. Subclass Click Form/Controls to customise HTML rendering. This is a good approach for ensuring a common LAF across your web application, but you will have to get your hands dirty and write some code. Use Panel class to create reusable HTML blocks. The Panel control support custom Velocity templates, which is an ideal way to create reusable HTML sections which you can include in many pages. Panels also support nested controls, enabling your sections to support control based behaviour. Use Velocity macros for a generic HTML layout. This is easy to do and gives you good reuse across your web application. Please see the Form velocity macros example, and also see the click-examples 'Velocity Macro' demonstration. Layout your HTML forms by hand. This gives you the ultimate control in presentation, but provides no reuse across your web application. Please see the Form manual layout example. See the section auto deployed files for details on how to customize and override a control's resources. 6. How can I have many Pages using the same HTML template? To do this use the Page templating technique detailed in the Page Templating topic. For a live demonstration of page templating deploy and run the click-examples application. 7. Why do control listeners methods have to return a boolean value? Control listener methods have to return a boolean value to state whether the Pages controls and methods should continue to be processed. To continue processing listener methods should return true, to abort they should return false. Please see the Page Navigation topic for more details. 8. Can you exclude some fields from a Form? To exclude some fields from being displayed in a shared Form class use the Form.removeFields() method. 9. How do you internationalize Pages and Controls? Click provides good support for application localization and internationalization (I18N) requirements. In your Login Page class you can use the getMessage() method to lookup request localized message strings. The AbstractControl class provides a number of getMessage(String) methods which support localized strings and message formatting. Please also see the Control topic Message Properties. 10. How do you encode Pages in the UTF-8 character set? This will configure the Velocity runtime to use UTF-8. This will set the pages HttpServletResponse "Content-Type" header to be "text/html;charset=UTF-8". Alternatively you can override the Page getContentType() method to this content type. 11. How do you specify the character set which is used in your application? This character set is used for Velocity input encoding, and response Content-Type. So if you specify the character set in WEB-INF/click.xml, you don't have to create WEB-INF/velocity.properties. If you want to use the other character set in your Velocity templates, you can override input encoding by WEB-INF/velocity.properties. See the previous topic. 12. How can you prevent multiple form posts? You can prevent multiple form posts by using the Post Redirect pattern. With this pattern once the user has posted a form you redirect to another page. If the user then presses the refresh button, they will be making a GET request on the current page. Please see the Redirect After Post article for more information on this topic. Another common way duplicate posts occur is if the user accidentally click the Form's submit button twice, in quick succession. Redirecting to another won't protect against the second accidental submit. Please see the Click Examples 'Page Flow' for a demonstration of the Post-Redirect and submit check patterns. 13. How can I use *.html Click pages? Click does not automatically map *.html files as Click pages. These files are not processed by the ClickServlet and are intended for use as static content. However see the FAQ on alternative extensions. 14. Can Click be mapped to an extension other than *.htm? By default Click supports *.htm and *.jsp extensions. However you can map templates with different extensions, for example *.xml, by subclassing XmlConfigService and specify extra mappings by overriding isTemplate(String path). You can read more details here. 15. Why am I getting "IllegalAccessException: Class org.apache.click.util.PropertyUtils can not access a member ..."
Class org.apache.click.util.PropertyUtils can not access a member of class "com.YourOwnClass" with modifiers "public". it's because "com.YourOwnClass" is not public. Make sure you add "public" to your class definition. 16. What JARs should I use with Click and Cayenne? 17. How can you integrate Click into Spring? To integrate Spring with Click configure the SpringClickServlet instead of the normal ClickServlet. The SpringClickServlet is contained in the Extras library and provides excellent integration options. The Spring MVC Framework however, is not compatible with Click. The Spring framework uses a low level command pattern design like Struts and WebWork. Spring uses a DispatcherServlet to route requests to Controller objects and then passes the ModelAndView results to the rendering layer. In Spring MVC the integration plugin points are the Controllers. Click uses higher level design constructs focusing on Pages and Controls. Click uses its own ClickServlet for dispatching requests to Pages and Controls, which are Click's plugin points. 18. Does Click support JSP? Click fully supports JSP pages. 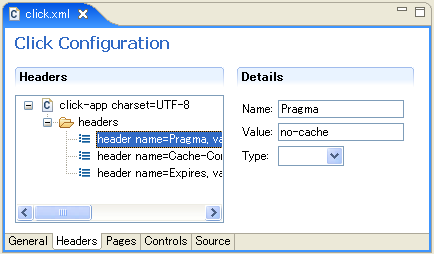 JSP Pages can be automatically loaded, like Velocity templates, or can be explicitly defined in the click.xml file. 19. How can I render PDF and Excel documents? By making use of the Direct Rendering support you can render directly to the servlet response and bypass the page template rendering. In order to bypass the Page template rendering you must set the Page path to null. If Click does not know the location of the Page template, it won't render it. If you do not set the Page path to null, Click will attempt to render the Page template which can lead to undesirable results. * The Page#onGet renders the report to the servlet output stream. * This method returns the report mime type based on the specified report type. 20. What is the performance of Click? When the Click framework processes a request it creates a relatively small number of objects. These include a Page, a Context, a Format and a number of Controls which in turn contain some Lists, Maps and Strings. The allocation of small/moderate numbers of short lived objects by modern JVMs is very, very fast. Please see the IBM article Urban performance legends, revisited. The amount of actual work Click does is pretty small. The onProcess() methods traverse a list of Controls and do simple operations. The Control toString() methods can allocate large StringBuffers when rendering tables, but forms rarely get larger than 4,000 characters. When Click creates a new StringBuffer it attempts to determine the maximum likely size to avoid additional memory allocation and arraycopy operations. The next step in processing the request is rendering the response. Velocity is largely responsible for this step. While hard performance numbers are difficult to come by in this area, until recently Velocity was considered to be faster than JSP. However, recent discussions on Velocity mail lists indicate that JSP compilers have improved to the point where JSP has a small performance lead over Velocity. What ever the case, JSP is very fast and so is Velocity. 21. How do I unit test Click pages? It is generally recommended that you don't write JUnit style automated unit tests for Click pages as the cost to benefit ratio is quite poor. If you have complex business logic in an Click page you should refactor this code into a business level service class which you can readily unit test and reuse in multiple places. If you still need to write unit tests for your Click pages, please read the documentation on the MockContainer and MockContext classes. 22. How do I deploy Click resources in restricted environments? Click works perfectly fine in these environments. The only issue one might encounter is Click's auto-deploy feature where static resources are copied to the webapp root directory at application startup. In restricted environments it might not be possible for Click to deploy its resources. Please see the user-guide section, Deploying resources in a restricted environment, for various solutions. 23. Why doesn't Click use Commons Logging / Log4J for logging? Click by default does not use Commons Logging / Log4J to avoid the class loader and configuration issues which often occur with these framework, and instead default to System.out using the ConsoleLogger. Click provides support for configurable LogServices and provides JdkLogService and Log4JLogService classes in Click Extras. 24. Why doesn't Click use FreeMarker instead of Velocity as the default template engine? FreeMarker is a powerful templating engine which was evaluated along side Velocity for use in Click. While FreeMarker has many sophisticated features Velocity lacks, Velocity was chosen as the default engine because it is easier to learn and doesn't use an XML style markup syntax. Please note however that Click provides support for FreeMarker with the FreemarkerTemplateService in Click Extras. 25. Can Click be used to develop Portlet applications? Unfortunately no. Click is built on top of the Servlet specification which is incompatible with the Portlet specification. However in a future Click release the Portals Bridges project could be leveraged to allow Click applications to run inside a Portlet container. 26. Why develop a new Web Application Framework? Because the existing frameworks did not meet my needs. Struts doesn't really do much, while Tapestry is too complicated. For a more comprehensive answer please see Why Click.